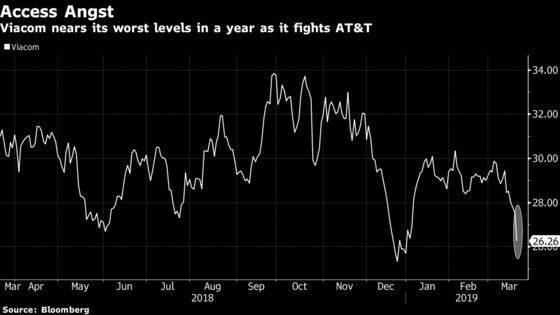 (Bloomberg) -- Viacom Inc., the owner of cable networks including Nickelodeon and MTV, fell as much as 4.7 percent after warning that pay-TV customers of AT&T Inc. could lose access to its movies and TV shows unless the companies reach a new programming agreement. The shares were down 4.5 percent to $26.27 in New York after falling as low as $26.23. AT&T, the owner of DirecTV, was down as much as 0.9 percent. It’s the largest U.S. pay-TV provider with 24.5 million customers. The current contract between the parties expires Friday, Viacom said Tuesday in an email. The media company began activating a “crawl” message on its networks, alerting customers of the looming dispute. In April, AT&T will raise prices on its streaming pay-TV service. The company boosted prices for its satellite TV service in January. The phone giant completed the purchase of Time Warner last year and in the past month won a final victory over the U.S. Justice Department’s efforts to stop the deal on antitrust grounds. Since then AT&T has begun reorganizing the business, which includes Warner Bros. studios, HBO and Turner Broadcasting. The division, which operates networks that compete with Viacom, has been rechristened WarnerMedia. Viacom was among several media stocks that slumped on March 13 following reports that AT&T would be removing channels from a reshaped DirecTV Now streaming service.